Booking party bus services in Costa Mesa does not need to be a tedious task. There are really just a few key things that are important: competitive prices, knowledgeable drivers and quality vehicles. Fortunately, with Party Bus Group you get great rates, better customer service and newer rides. We’re the only OC party bus limo company needed for all of your party bus services in the county! 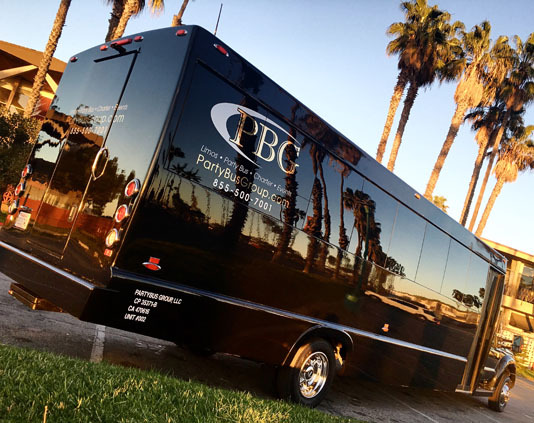 PBG offers small, medium and large party bus rentals in Costa Mesa and the surrounding areas at the best rates. Our fully loaded vehicles come with prime wrap around leather seating, premium sound systems, state of the art lighting, flat screen TV’s, more than one bar area and even bathrooms on our bigger vehicles! If you need to book a party bus in Costa Mesa there’s no need to look further than The Party Bus Group here. No other party bus service has better reputation than us. Take a look at our reviews on websites like Yelp, Thumbtack or top wedding sites like The Knot. You can find our company registered with the National Limousine Association (NLA) and the California Public Utilities Commission proving we are fully licensed and insured by the State of California. We are not a broker, we operate our own fleet of SUVs, limousines, sprinters and party buses across the county for any occasion, so rest assured you are getting the best rate for your bus rental directly with us! WHY RENT A PARTY BUS IN COSTA MESA WITH US? Designated driver: You don’t have to worry about traffic, parking, or anything else in Costa Mesa. Sit back and sip a cocktail or two while we handle the hard stuff. Take all your friends along: with buses that can accommodate up to 50 people, there’s no need to leave anyone behind in Costa Mesa. No parking mess: When you get where you’re going, you won’t have to worry about parking (or paying for it) it’s all included. Just hop out, enjoy yourself, and climb back aboard for the return trip to Costa Mesa! It’s Convenient: Our party bus will pick you up anywhere in Costa Mesa or the surrounding areas and at the end of the event we’ll drop you off right at your door. It’s easy to rent with us, Costa Mesa party goers can simply visit our website or give us a call. Looking for the best party bus rentals provider? Party Bus Group offers some of the best prices and with thousands of happy customers, you know you’ll enjoy your event. Our company owned limousines and buses can accommodate parties of 10, 20, 30, 40 and even 50 friends! Not many other local services offer what we do. Give us a call about your party bus rentals in Costa Mesa today! From start to finish our experience with the Party Bus Group was amazing! I worked with Adam at the beginning and Anthony once the reservation was made. They were affordable and extremely accommodating (even when we asked to change the destination last minute).